SAVE 2000 DOLLARS OFF MSRP | EXTRA 3000 DOLLAR REBATE AVAILABLE | 5000 IN TOTAL SAVINGS!!! We always have 1 beetle in our fleet of Demo's... If you have not guessed just about everyone love this car! Many of our clients want to experiance the beetle so this is available for anyone to try! 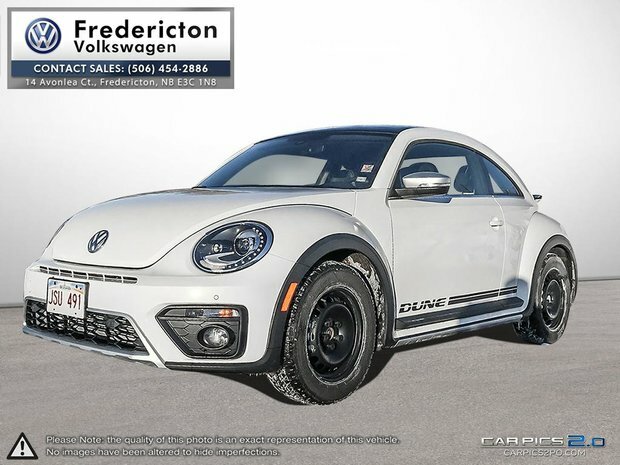 Dune features include 18 inch wheels, Bi Xenon head lights with LED day time running lights, Dune stance is 10mm higher than the standard beetle giving it that edgy appearnce that everyone loves! It's loaded with heated seats, heated washer nozzels, pan roof, rain sensing wipers, rear spoiler, power you name it... VW infotainment incudes full cell phone integration, blind spot vw kessy, park distance and Sirus XM equiped. Take advantage of the huge discounts and low mileage on this super cool Dune! Want to try the 2018 Volkswagen The Beetle Dune Coupe 2.0T 6sp at w/Tip?